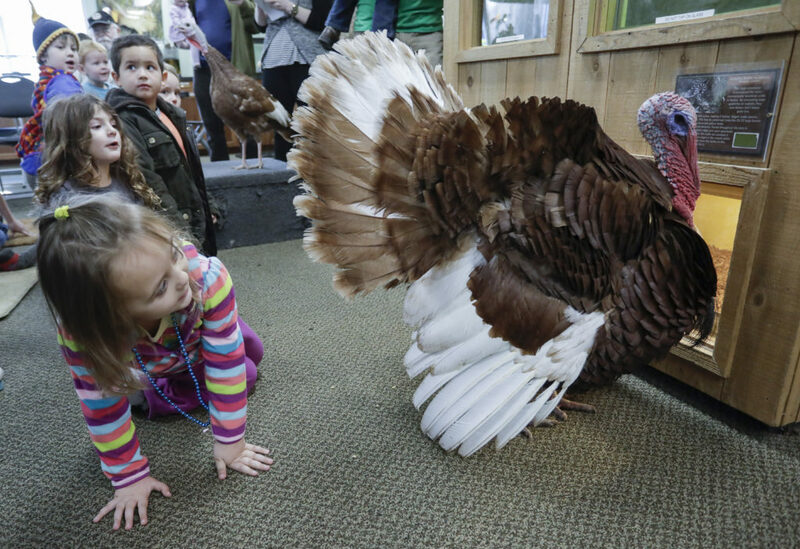 Four-year-old Amelia Meyer, Lawrence, tries to draw the attention of Tom the turkey during Turkey Time Tuesday, Nov. 21, at Prairie Park Nature Center, 2730 Harper St.
A handful of Lawrence kids gobbled up the chance to play with turkeys this week at the Prairie Park Nature Center. The birds, a pair of Bourbon Reds named Tom and Jenny, won’t be on the table this Thanksgiving, thankfully. 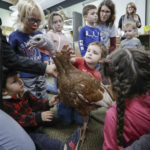 But Dara Wilson, a naturalist at the nature center who keeps the turkeys as pets, feels it’s important that children know where their food comes from. 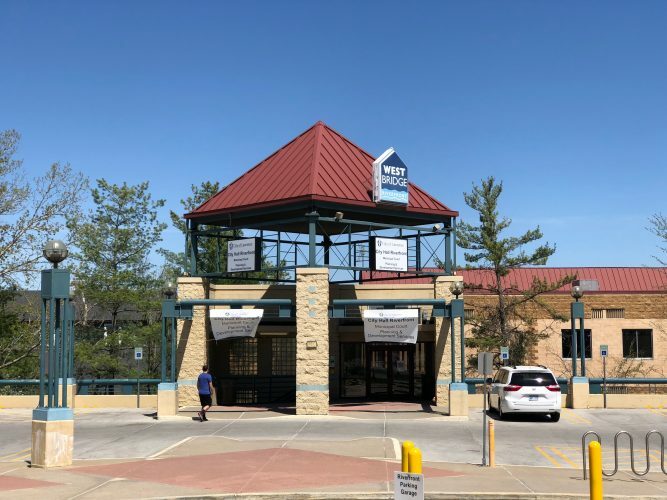 “Kids see it at the grocery store, but they don’t realize it’s meat,” Wilson said Tuesday after introducing her pets to the preschoolers. 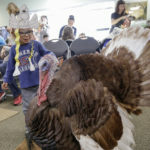 Wilson’s annual “Turkey Time” event has been a staple at the Prairie Park Nature Center since she adopted her turkeys as chicks four years ago. “They’re veterans now,” she says of the surprisingly docile Tom and Jenny. 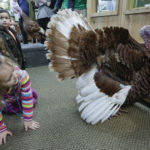 Children get an up close and personal visit with Jenny the turkey during Turkey Time Tuesday, Nov. 21, at Prairie Park Nature Center, 2730 Harper St.
Luckily, her nervousness didn’t last. Because Wilson adopted her turkeys as chicks, the birds aren’t skittish around people, she said. “She’s pretty much like a dog. She even likes to be hugged,” Wilson said of Jenny, while Tom mostly enjoys “showing off” his plumage. 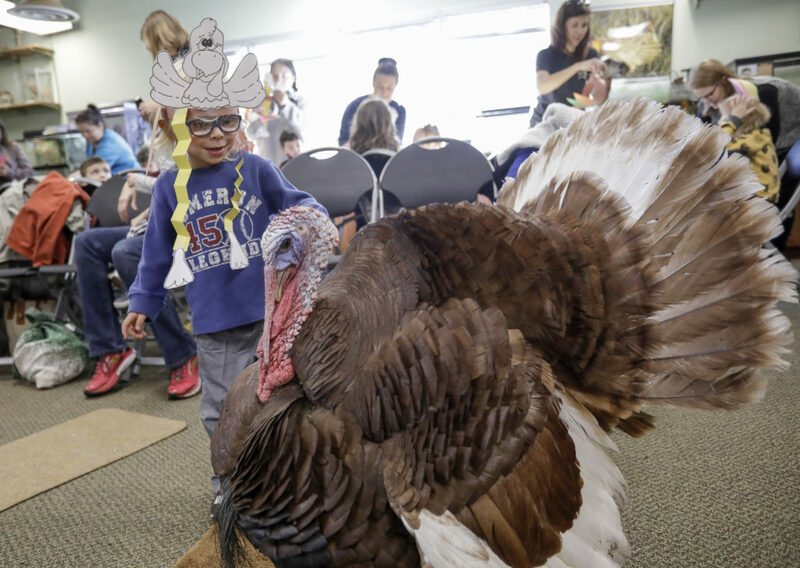 Three-year-old Henry Hout, wearing a turkey hat he just constructed, pets Tom the turkey during Turkey Time on Tuesday, Nov. 21, at Prairie Park Nature Center, 2730 Harper St. Two turkeys, a male named Tom and a female named Jenny, were introduced to the children. They are the pets of Dara Wilson, a naturalist at the nature center. Three-year-old Rusty Graham likes petting the birds the best. When asked if he was excited to eat turkey on Thanksgiving, the little boy’s eyes widened in surprise. “Wait, we’re eating a real, live turkey?” he asked. But then, the moment passed. 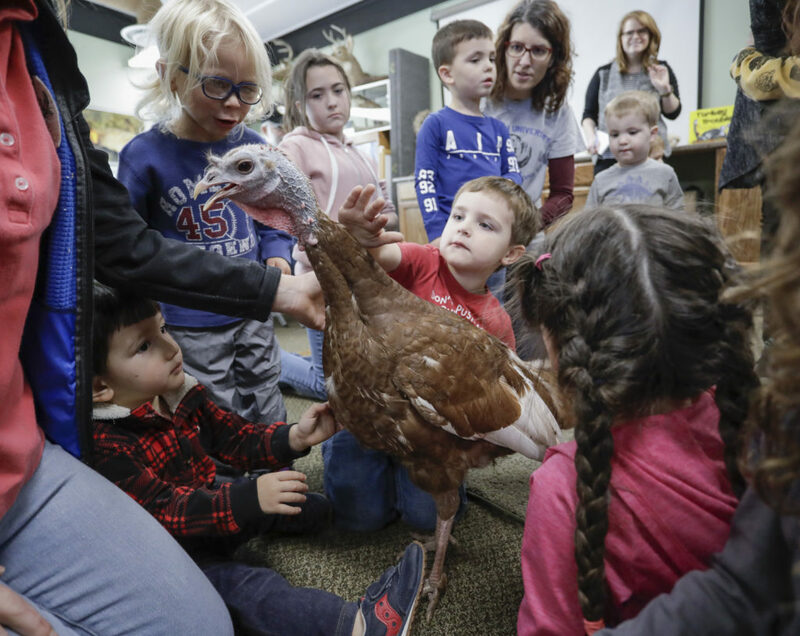 Kids don’t seem to be fazed much by the circle of life, said Wilson, who also let adventurous preschoolers watch as she fed dead mice to the nature center’s turkey vulture, as well as vegetarian fare to smaller, tamer animals like a chipmunk and a prairie dog. The kids’ snack, to finish off the morning? Cheese and a little turkey.